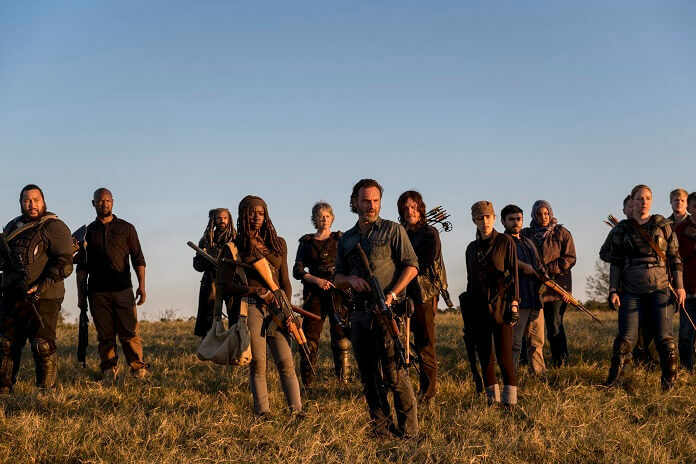 The season eight finale of AMC’s The Walking Dead starts off with Rick (Andrew Lincoln) taking a trip down memory lane. He’s holding hands with a very young Carl as they pass by peaceful cows grazing in a field. The scene quickly jumps to gross closeups of walkers and just as quickly moves to Rick covering baby Judith in her crib. Siddiq (Avi Nash) arrives with a bottle for Judith and Rick finally asks about the events surrounding Carl being bitten. Siddiq explains they were heading back to Alexandria and Carl was honoring Siddiq’s mother’s beliefs about the walking dead. “He died paying respects to a woman he never knew,” explains Siddiq. He’s sorry he didn’t think about how dangerous it was and Rick thanks him for explaining what happened. Everyone prepares for battle including Ezekiel (Khary Payton) who’s ready to accept what fate offers. He knows they must risk losing everything, and Jerry (Cooper Andrews) does his best to keep the moment light by declaring they’re not going to lose sh*t.
Daryl (Norman Reedus), Rosita (Christian Serratos), Maggie (Lauren Cohan), Carol (Melissa McBride), Michonne (Danai Gurira), and Rick speculate about whether the note and map of outposts Dwight passed to them is real or a setup. As they talk, Morgan (Lennie James) walks by looking confused. He thinks something’s up but doesn’t know what. He almost attacks Henry, not realizing what he’s doing. Fortunately, depending on your opinion of the Henry character, Carol stops him. The first team is heading out in 20 minutes and Maggie tells the ex-Saviors/former prisoners they must remain behind. Rick also doesn’t want Morgan to go, but Morgan claims he’s going to keep everybody alive. He’s definitely not himself, but he makes sense when he tells Rick they aren’t as good as the men they used to be. However, he wants to just finish this now. The first team with Jesus, Ezekiel, Michonne, Morgan, Rick, Daryl, Rosita, Jerry, Maggie, Carol and a dozen or so others head out, unsure if they’re heading into a trap. Eugene wants to ride along with Negan, confirming he needs to see this attack through to its end. Negan wants Gabriel to also join them, saying he has things to confess. 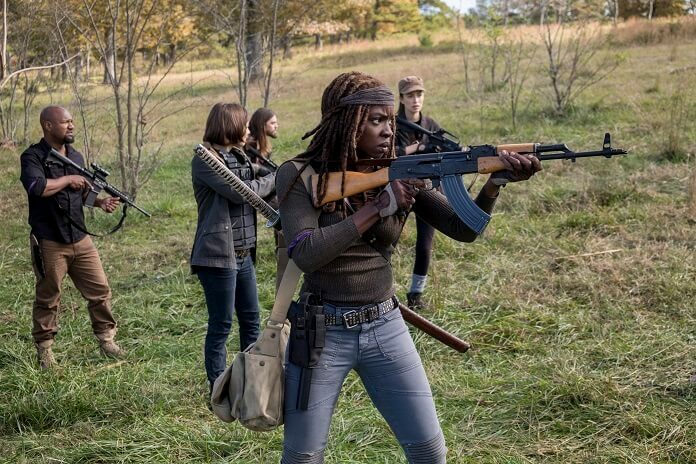 Rick’s people spy the group of Saviors Negan just sent out and prepare to attack. Negan sent his people out to be sacrificed as a way of making Rick believe Dwight’s map was legitimate. Negan explains to Gabriel that it’s a setup and he’s luring them into a false sense of security. He’s also given this group a fake map with a time and place to meet up with Negan. Rick’s group kills the small crew of Saviors, and Morgan’s particularly brutal as he slices the neck of a man who’s giving up. Ezekiel finds the map and it indicates the Saviors are lining up on the Old Mill road. Rick radios in and says it was a trap and they’re changing their plan. Gabriel can’t believe Negan wants to kill every last one of Rick’s people. At the first opportunity, Gabriel jumps from the backseat of the car. The convoy stops and Gabriel makes his way through the woods. He’s almost bitten by a walker when Eugene finds him and holds a gun to his head. Gabriel cries and Eugene wonders where his faith went. Negan arrives and hits Gabriel in the stomach with Lucille. He has Gabriel taken back to the car. Jesus (Tom Payne) and Morgan talk as the group walks toward their next battle with the Saviors. Jesus reminds Morgan he can stop people without killing them, suggesting he use the blunt end of the staff for the living and the pointy end on the dead. Saviors approach Hilltop in a caravan and Tara (Alanna Masterson) hustles people into a hiding place. Rick’s group comes to a sudden stop when they hear whistling. There are speakers set up in the woods and Negan declares he’s ambushed Rick’s ambush with an even bigger ambush. He teases Rick, telling him to pick a direction to run. It doesn’t matter where he heads because the Saviors will be there. Negan informs Rick he knows Dwight was slipping him information. Negan also reveals he has Eugene and Father Gabriel with him. Negan says he’s going to kill Gabriel and Dwight, and then tells Rick to just accept how things are. Eugene signals to Negan and Negan counts down…three…two…one and suddenly a massive group of Saviors appear. Rick’s group is momentarily stunned when the Saviors fire as a unit and all their bullets explode in the guns, taking out or injuring a large swath of Negan’s people. Eugene has saved the day! Rick’s group charges as Gabriel hits Negan and Negan, hand injured, grabs Lucille. The attack begins in full as Rick’s people take on the Saviors. Back at Hilltop, Tara leads the group into the woods but doesn’t go with them. She’s going to return to the Hilltop and reluctantly accepts help from the prisoners who volunteer to help fight the Saviors. Rosita stops Eugene from being killed and Morgan holds back and doesn’t kill a Savior, instead he just knocks him out. Tara and her group are taken by surprise when the Saviors outside Hilltop are greeted with an attack by the Oceanside women and Aaron (Ross Marquand). They toss bombs at the Saviors and light them all on fire, easily defeating the group and defending Hilltop. Saviors kneel before Maggie and give themselves up while Rick chases down Negan. Rick runs out of bullets and has to resort to hand-to-hand combat. Negan tosses Lucille aside as they roll in the weeds. Negan has Rick down and is kicking him, and then picks up Lucille once again. Negan brings up Carl which gives Rick a second wind. They’re both in bad shape but Negan manages to get to his feet once again. Rick delays the attack by claiming they can still have a future. Rick asks for 10 seconds to tell him how, saying it’s for Carl. Negan counts down from 10 as Rick says Carl didn’t want it to be a fight. Rick thinks Carl was right and his eyes fill with tears. Negan also looks ready to cry. However, it’s all a ploy. Rick slices Negan’s throat with a piece of glass from a nearby stained-glass panel while Negan’s guard is down. Negan’s bleeding out and behind Rick the remaining Saviors and Rick’s people are gathered on a hill, watching. Rick calls someone over to save Negan and Maggie reacts by screaming, “No!” She wants Negan dead to make things right, saying it won’t be over until he’s dead. Michonne hugs her and lets her cry. Rick tells the Saviors to put their hands down. It’s over and they can all go home now. He declares Negan’s way of doing things is over. If they can’t live with that, then they’ll pay the price. Otherwise, they can all live in peace and fairness. Rosita asks Eugene about the bullets and he admits he did sabotage them. She then hits him in the face for puking on her. Eugene’s fine with that and knows he had it coming. Morgan gives his protective gear to Carol to pass on to Henry. He’s going to try to be okay, but he needs to leave. The close-up of Rick’s face with red, teary eyes from the beginning of the season is shown again and he says, “My mercy prevails over my wrath.” He takes a seat under a tree by himself and cries. Alden (Callan McAuliffe) has a chat with Maggie and he wants to stay at the Hillside and help out. He can build things and wants to help this community and not return with the rest of the Saviors. She gives him permission to stick around. Tara and Rosita head to the Saviors’ Sanctuary and speak with the Saviors. Tara and Rosita have brought people to help put the Saviors’ compound back in shape. Dwight and Daryl take a trip into the woods. Dwight knows he’s about to die because of what he did to Denise and other people. He realizes he must pay for his deeds and is ready. He smiles and claims he’s happy he lived to see Negan taken down. Dwight kneels in front of Daryl and apologizes for everything. Daryl tells Dwight to be quiet, tosses him keys, and sends him away. Dwight’s banished but alive. “You go out there and you make it right. Find her,” says Daryl, walking away. Morgan arrives at Jadis’ compound and Jadis lets him in. He delivers a message from Rick that Jadis can come back to the community, if she wants. He tells her Rick needs all the hands he can get and wants to show everyone things can change. He tells her everything that’s worth a damn is about people. They formally introduce themselves, with Jadis saying her real name is Anne. Morgan says he won’t be going with her, but she should head off to Hilltop to be with people. Dwight arrives at his old place and finds a note addressed to “D.” He laughs. It says “Honeymoon” with the sign for infinity. Ezekiel, Jerry, Henry, and Carol return to The Kingdom. Inside the main house at Hilltop, Maggie and Jesus talk about what has happened. She agrees he was right about saving the Saviors prisoners. However, she doesn’t think Rick was right about not killing Negan. She wants to build the Hilltop up and make this place thrive. She believes Rick and Michonne were wrong. She suggests they bide their time and then show Rick what he should have done. Daryl steps forward from the shadows and agrees. Negan’s in a bed with his neck bandaged, pretending to sleep. Rick and Michonne tell him they want him alive to see what’s going to happen now that the war is over. Rick and Michonne threaten to open up the stitches to remind him what they can do. Rick then tells Negan he’ll have a job, too. Michonne says he’ll be an example and Rick lets him know he’ll be rotting in a cell for the rest of his life. It will be evidence they’re making a civilization out of the ruins and that things can return to normal. By keeping him alive, it shows there is justice in this world and Negan must pay. Rick has a quiet moment and writes a note to Carl. He thanks Carl for making him a better man and for showing him this new world.